Injuries from exercise can happen instantly or slowly. You don’t have to have a sudden traumatic injury to tear your rotator cuff; you can gradually develop a rotator cuff tear as a result of overuse or wear and tear. Your rotator cuff is a set of four small muscles: the supraspinatus, infraspinatus, teres minor and subscapularis. Together, these muscles form a “cuff” that lifts, rotates and stabilizes your shoulder, holding your humerus in place against the socket. Repeated overhead motions in sports such as baseball and tennis can put you at increased risk of overuse rotator cuff injuries. Reaching overhead repeatedly can cause rotator cuff problems over time. Repetitive strain to the rotator cuff can cause rotator cuff tendinitis or impingement syndrome, both of which will side-line you from your favorite activities until your shoulder heals. Lowering the bar too far on a bench press puts your shoulders in an unstable position, placing extra stress on the entire shoulder joint. Rotator cuff injuries can also happen as a secondary result of other shoulder injuries, such as dislocation. Counter this problem by keeping the weight under control at all times so that you don’t accidentally lower it too far. Whether you’re doing dumbbell chest flies while lying on a bench or using a pec deck machine, lowering the weight too far places your shoulder in the most vulnerable position possible: externally rotated and transversely adducted. 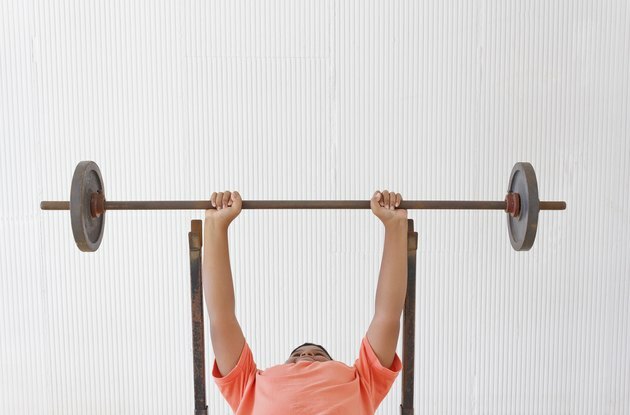 As with the bench press, limit your risk by confining yourself to a pain-free, stable range of motion, and don't let your elbows go farther back or down than your shoulders. Bringing overhead exercises back behind the neck, including behind-the-neck presses and behind-the-neck lat pulldowns or pullups, places your shoulder in a vulnerable, externally rotated position once again. Make these exercises safe by bringing the bar down in front of your neck instead of behind it. Slumping forward increases the risk of a muscle or tendon becoming pinched beneath your shoulder bones. Maintaining proper posture as you exercise -- which includes not slouching forward on the stair stepper, and sitting up straight with your chest up and out and shoulder blades back and down, for weight lifting -- helps reduce the risk of this occurring. What Is a Bench Squat Exercise?